Crystal; silver, silver gilt; niello. Made of rock crystal, this pendant is in the form of a fish. It has a fin at the top, carved with diaper work, and two carved fins below. The body ends in a stylised tail and a deep tube is pierced down its middle. The crystal probably dates from the Fatimid period (AD 969-1171), and was perhaps carved by an Islamic craftsman in Cairo. The head was either damaged or already missing when a goldsmith in the West, possibly in Paris,embellished it with precious mounts for use as a pendant. The mounts consist of a moulded rim of silver-gilt, decorated with a pattern of leaves. Around the mouth is nielloed (inlaid in black) the Lombardic inscription 'AVE: MARIA: GRACIA: PL[E]NA'. This Christian inscription means 'Hail Mary, full of Grace', and frequently occurs on medieval objects, probably reflecting their owner's devotion to the Virgin Mary. Pendant, comprising a crystal carved in the form of a fish, mounted with silver decorated with silver gilt and niello to form a pendant. The crystal is Islamic (Fatimid period), carved in the form of a fish with a fin at the top, decorated with diaper pattern, and two carved fins below. The body ends in a stylized tail with a ribbed ring around. A narrow carved collar figures the gills at the neck, and a deep tube is pierced down the centre. The head was cut off when the fish was mounted as a pendant in Western Europe to form a pendant. The mounts consist of a moulded rim of silver gilt, decorated with a pattern of leaves reserved in the metal on a nielloed ground. The mouth is engraved with an inscription in Lombardic letters 'AVE: MARIA: GRACIA: PL[E]NA' (Hail Mary, full of Grace), these letters nielloed. The crystal is held by four moulded spurs descending from the rim, to the left and right spurs, which are shorter, are attached moulded suspension rings. Closed by a screw stopper, to whose knop is attached a suspension looop. The base, upper ends of the body, and the ends of the fins are chipped. It is possible that the end of the tail was ground down to its present shape when the fish was mounted as a pendant. This crystal is an example of Fatimid art. The Fatimids were an Islamic dynasty that ruled Ifriqya (modern Tunisia) between 909 and 972 AD and Egypt between 969 and 1171 AD. Rock crystal is a clear, colourless quartz, the carving of which was practised in Fatimid Cairo, as well as in Iran, Iraq and Syria, and, many centuries later in France, Germany and Italy. The container, carved in the form of a fish, was probably originally a perfume flask. It has been dated to the 10th century (see Wentzel: 1972, plate 59 a). By the 14th century, the head of the fish was either damaged or cut off and mounts added, to create a pendant. A similar pendant is described in the inventory of Margaret of Flanders, Duchess of Burgundy and widow of Philip the Bold (1342-1404). The inventory, compiled after the death of Maguerite in 1405, describes the pendant as un petit cristal à fachon de poisson garni d'argent à mettre reliques ( 'a small vessel of crystal in the style of a fish mounted in silver for holding relics'). This reference highlights the importance of reliquaries amongst the laity in this period; the lack of further documentation means it is impossible to establish whether the flask now in the V&A is indeed the one owned by Margaret of Flanders. 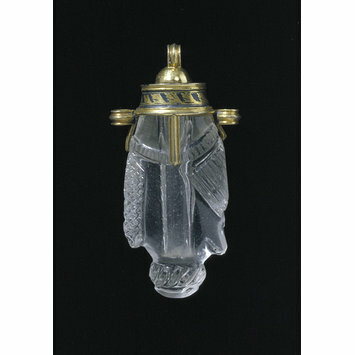 This Fatimid crystal must have seemed particularly appropriate for use as a Western pendant reliquary, in part because of the Christian symbolism of the fish (often used to symbolise Christ because the letters in the Greek word for 'fish' can be read as an acronym for 'Jesus Christ God's Son is Saviour') and in part because the rock crystal enabled the contents of the flask to be seen. The combination of rock crystal and the inscription suggest that the flask once contained a tiny relic of hair, clothes or milk of the Virgin Mary. Although inscriptions that refer to Jesus, the Virgin Mary and saints are frequent on medieval jewellery (such as rings and brooches) and are designed to reflect the wearer's devotion and protect him or her from harm, in this case the written reference to Mary is combined with the shining, transparent and colourless qualities of rock crystal which, according to church scholars, particularly symbolised her virginal purity. Like most medieval jewels, nothing is known about the former owners or the craftsmen who made this exquisite piece. However, a little of its history can be teased out by close examination. Made of rock crystal, the container is carved in the form of a fish, with decorative mounts and a screw top made of gilded and nielloed silver. Rock crystal is a clear, colourless quartz, the carving of which was practised in Iran, Iraq, Syria and Egypt between the eighth and 11th centuries. Later, in the 13th century, European craftsmen in Paris and Venice also mastered the skill. The silver gilt mounts can be dated, very approximately, by virtue of the style of the nielloed ornament and the letter forms used. Both are typical of Northern European, especially Parisian, goldsmiths’ work of circa 1300. However, the delicately carved crystal fish is typical of the workmanship of a remoter time, that of Fatimid Egypt in the 10th century. Clearly the fish later found its way to Europe, where it was adapted for use by, presumably, a new owner. The tail fin has been cut down slightly, and the head of the fish removed before being adorned with precious mounts by a Parisian goldsmith. Cairo, the seat of the Fatimid court – the Islamic dynasty that ruled Egypt between 969 and 1171 – was probably the main centre of crystal production. These crystals were much admired and traded, and over 150 have survived, mostly in the great royal and cathedral treasuries of Europe. In the Middle Ages and beyond, because of their brilliance of colour or hardness, gems and hardstones were believed to possess many potent qualities, both medicinal and magical. Throughout the ages jewellery has been of crucial importance as an indicator of the wearer’s social importance and wealth. In addition, it has traditionally reflected faith and superstition, allegiances and even literacy, and was worn as much by men as by women. Jewels were also by far the most valuable form of portable wealth. Most of the gold and some of the silver used in the Middle Ages was recycled from past epochs, and many of the gems and hardstones used were probably survivals from the ancient world of the Roman Empire. The journey made by this particular pendant reflects the extensive exchange of precious objects via busy trade routes that connected the Middle East with Europe. It may have been a gift from one potentate to another, or brought to Europe by a travelling merchant or specialist in precious stones. Two suspension rings on the flask’s rim indicate that it was intended to be worn like a jewel, probably around the neck or perhaps suspended from a belt. A long tubular cavity pierces the length of the crystal. A Latin inscription on the mount of the flask rim reads ' Ave Maria Gracia Plena' – ‘Hail Mary full of Grace’. Christian piety was often expressed by the wearing of a pendant containing relics such as fragments of bones, clothing or possessions associated with Christ, the Virgin Mary and the saints and this small container, which probably held precious perfume in the Islamic world, appears to have been recycled as a reliquary in the Christian West. There are surviving examples of pendant reliquaries made to hold tiny relics, another V&A pendant 358-1864 being one such example. Personal reliquaries were popular in the Middle Ages and were worn by clerics and lay people alike. Relics were worn for their protective powers, and were usually worn very close to the body. Some private reliquaries enabled relics to be removed, possibly for the purpose of touching or kissing the relic. In 1215 however, Canon 62 of the 4th Lateran Council forbade relics to be viewed outside their reliquaries (ut antiquae reliquiae amodo extra capsam non ostendantur, nec exponatur venales). From the 13th century onwards, personal reliquaries in glass or crystal were more common, as the relic could be seen without being removed from its shrine. Pendant, crystal with silver, silver gilt and nielloed mounts. The crystal made in Egypt 900-1000, the mounts probably France ca.1300. Contadini, Anna. Fatimid Art at the Victoria and Albert Museum, London, V&A Publications, 1998. ISBN 1851771786. Wentzel, Hans. 'Das Byzantinische Erbe der Ottonischen Kaiser- Hypothesen über der Brautschatz der Theophano, Aachen'. Aachener Kunstblätter. Vol 43, 1972. pp.11-96. Lamm, Carl Johan. Mittelalterliche Gläser und Steinschnittarbeiten aus dem Nahen Osten. Forschungen zur islamischen Kunst, 5. 2 vols. Berlin: D. Reimer, 1929-30. Morero, E., H. Procopiou, R. Vargiolu, J. Johns and H. Zahouani. 'Carving and polishing techniques of Fatimid rock crystal ewers (10th - 12th cent. AD.)'. Wear. Vol. 301, issues 1-2, April-May 2013. pp. 150-56. Jung, Jacqueline E. ‘Crystalline Wombs and Pregnant Hearts: The Exuberant Bodies of the Katharinenthal Visitation Group’. In: History in the Comic Mode [Medieval Communities and the Matter of Person], ed. by Rachel Fulston and Bruce W. Holsinger. New York: Columbia University Press, 2007, pp. 223-37. 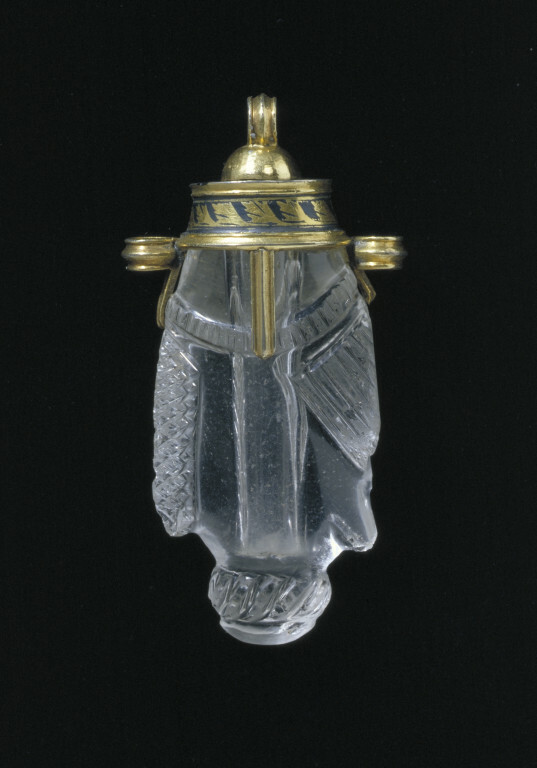 The crystal made in Fatimid Egypt, the mounts probably made in France.